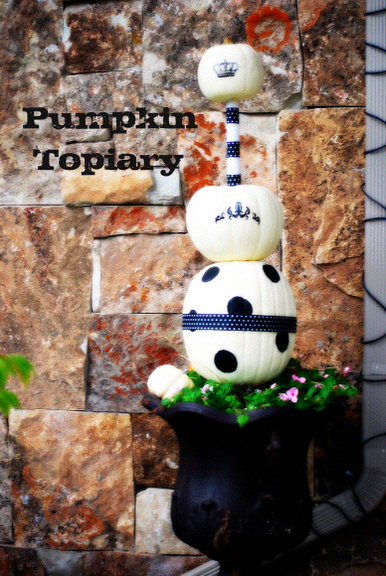 It's Pumpkin Week -- Polka Dot Plus Pumpkins! 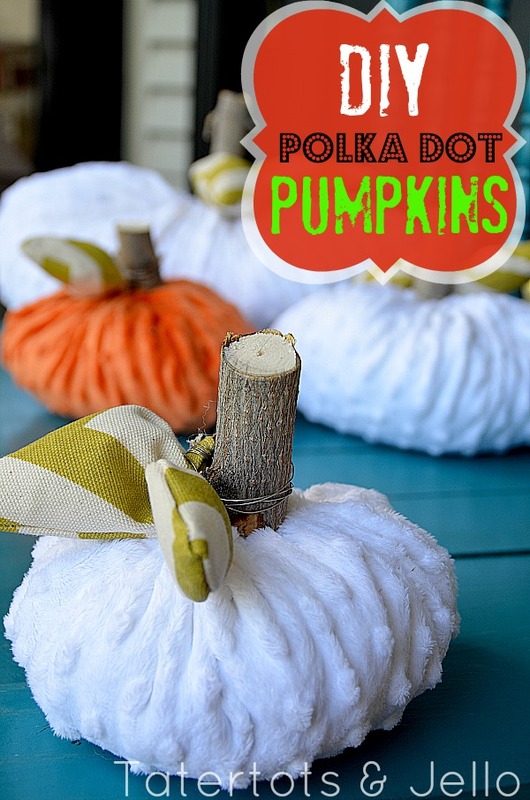 Today I am sharing my Polka Dot Pumpkins!! 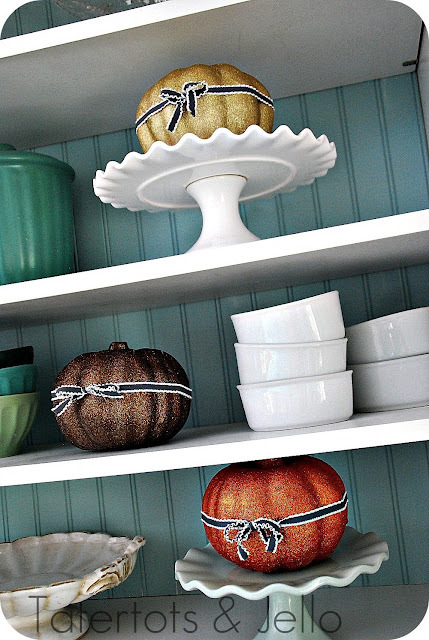 What could be better than polka dots AND pumpkins = two of my favorite things! 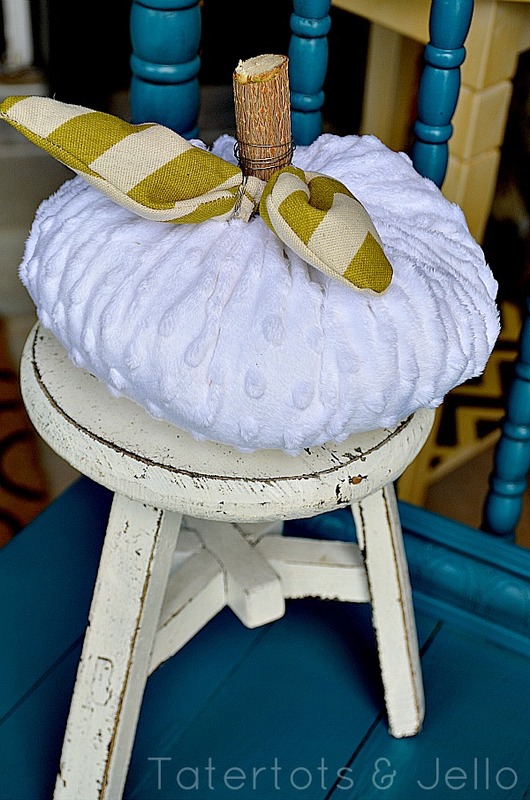 Minky material (polka dot plush) — I found it at Hobby Lobby. 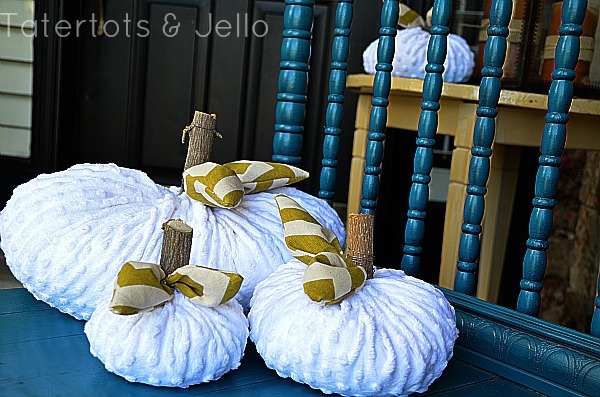 You can make about 4 pumpkins with 1/2 yard of material, depending on how big you make the pumpkins. 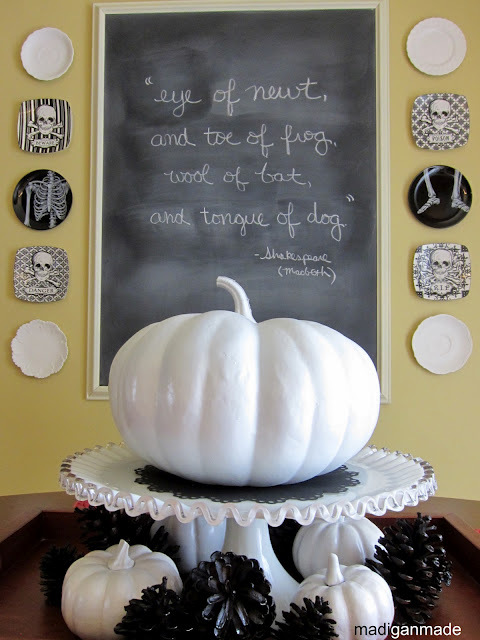 Cut out circles for your pumpkins. Each circle will be about 1/4 of the size when it’s all finished. 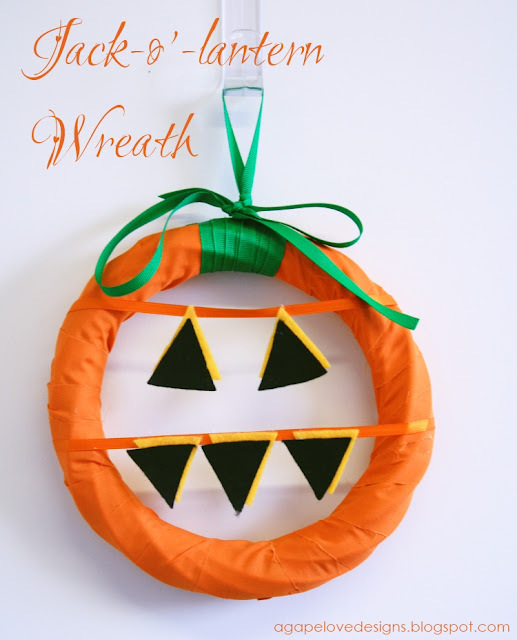 Use a needle and thread to sew the circle shut. Sew all the way around the edge of the circle. The stuff the pumpkins with beans at the bottom and batting at the top. Pull the thread tight and tie it off. Then sew the opening shut. Now make the leaves. Cut leave shapes out of coordinating material. Each leaf will need two sides. Put the right-facing sides together for the leaves and sew. Then turn them right side out. 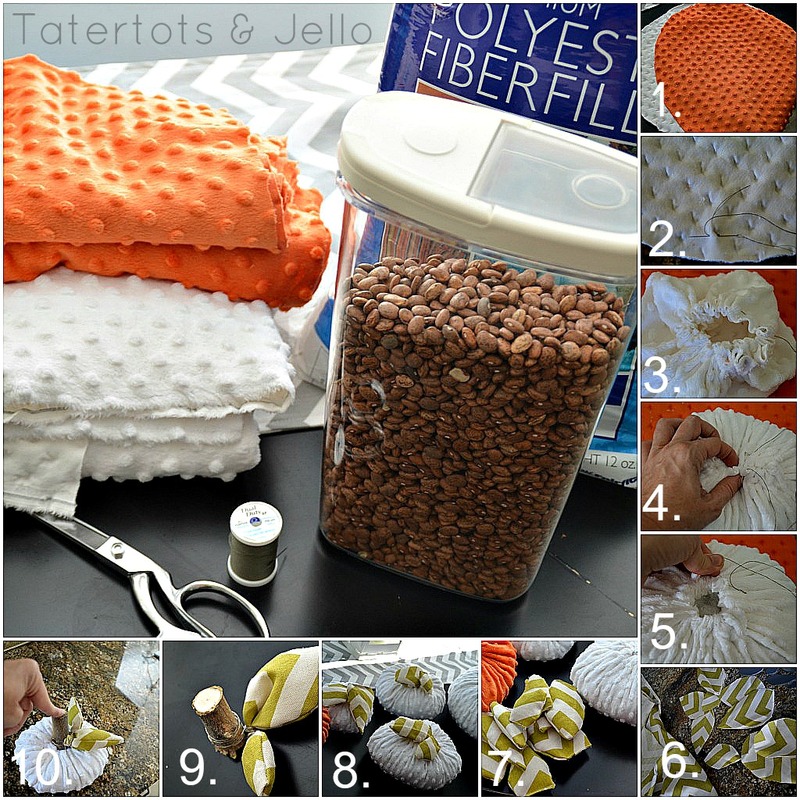 Stuff the leaves with a little batting and sew the seams shut. Tape wire and wrap the wire around a leaf 5-6 times. Then wrap the wire around the tree branch and then around a second leaf. Twist the two leafs together. Put a dab of hot glue at the back of each leaf and on the stem to secure everything. 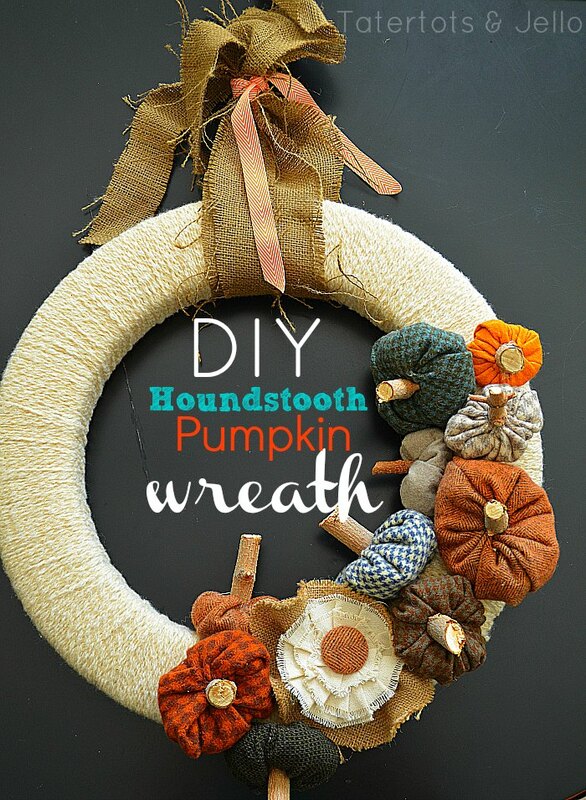 Put a couple dabs of hot glue in the center of the pumpkin seam and press the tree branch into the center. Press down until secure. And that is it!! 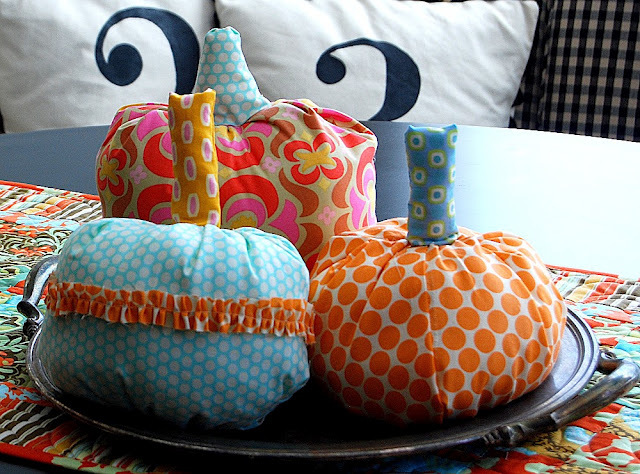 Now you have some plush Polka Dot Pumpkins. Ella loved these so much that she is sleeping with one. The minky material is so soft!! Share YOUR ideas and links in the comments — I would love to see them!! 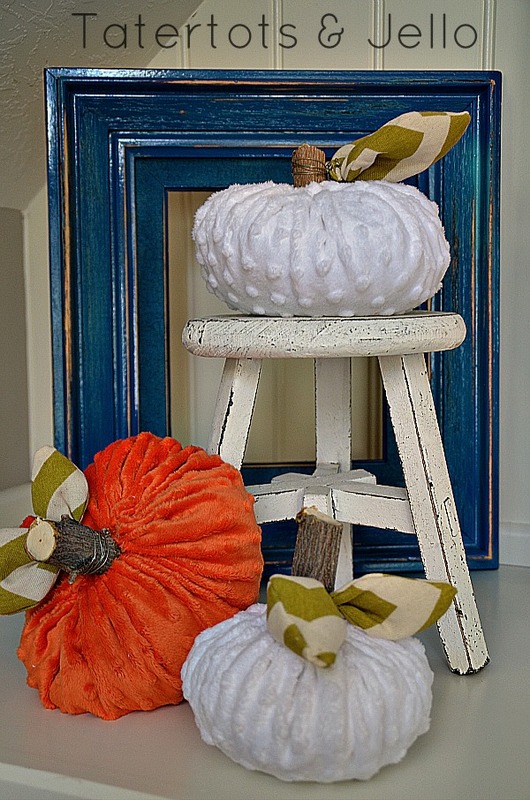 Dollar Store Crackled Pumpkin Tutorial! 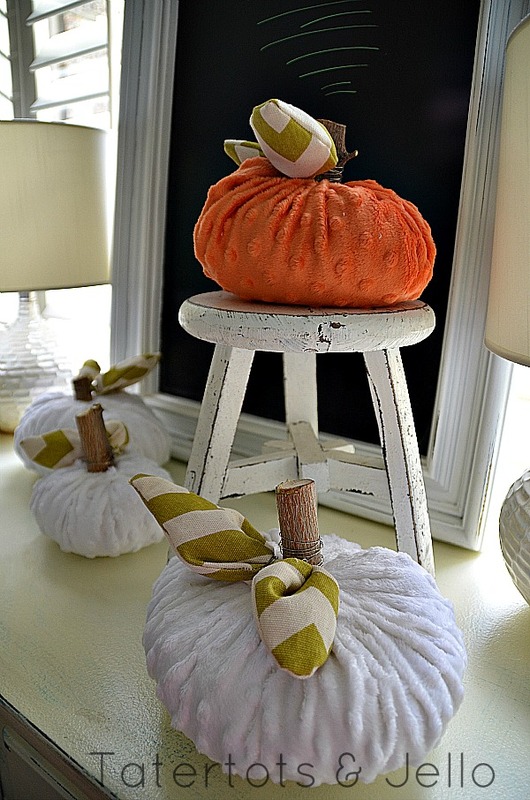 Fall Project — Ruffled Fabric Pumpkins! 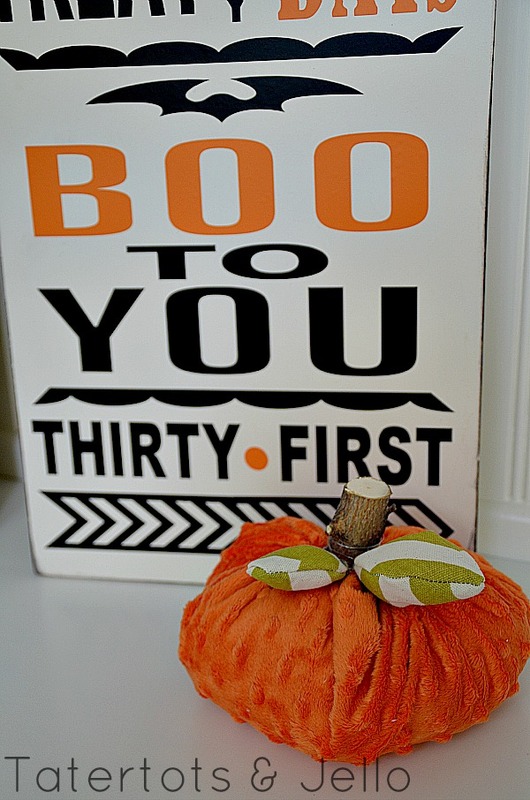 Make an Easy Halloween Ribbon Table Runner!! Hi! I’m linked up for the pumpkin week link. first time here. Lot’s of wonderful crafts here. These are such creative ideas 🙂 I really like the glittery pumpkins. Gorgeous! You always manage to make the *cutest* things!!! this is such a great idea. i can’t wait to see them all! eek! Fall is here. woot woot! I am totally in love with these!!! Here’s my wood block pumkins. I love seeing all these ideas! Erin — your wood block pumpkins are so so cute. Love them!! Thanks for commenting and leaving a link to your project! 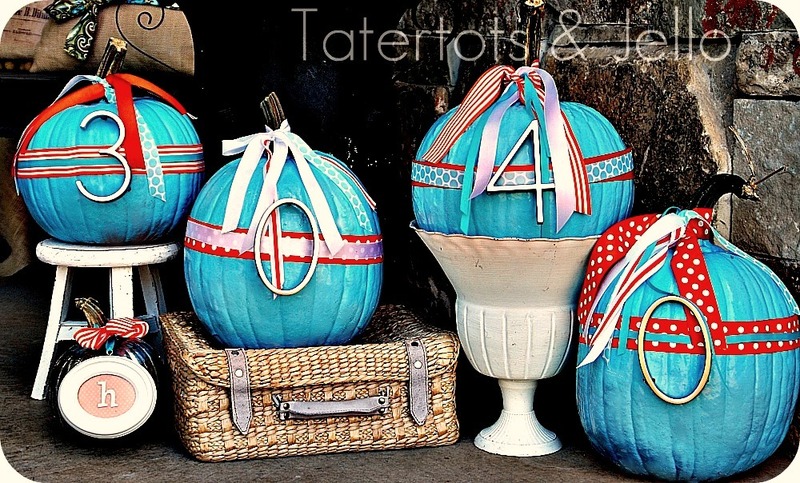 Love those pumpkins what a great tutorial! 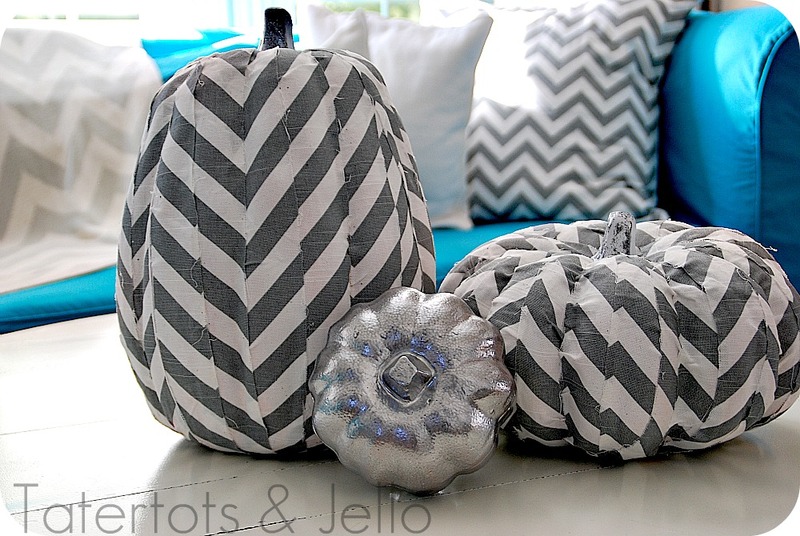 I made glitter pumpkins last year and cannot wait to get those out and decorate the inside of my home this week! So fun!! I love your glittered pumpkins!! 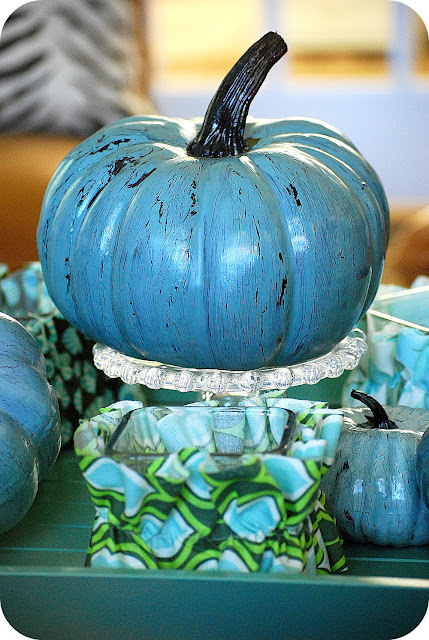 I made some glittered pumpkins last year on a whim and they are some of my favorite Fall decorating items now. Jen! That is so creative!!! I love that you used pine needles. And it turned out so great. I love it on your mantel!! I’ve done something like this, but that’s a great idea to use beans to stabilize it. Thanks for the tip! Jen those are so stinking adorable. Times like this I wish I was crafty! Guess I’ll go bake something…. LOL Aimee!! If you make me some cookies, I will make you a pumpkin. We would make a good team!